Former Hastings resident Rodney Wayne Cover, 77, passed away Wednesday, September 26, 2018, at Edgewood Vista in Fremont, Nebraska. Memorial service is 11:00 am Monday, October 1, 2018, at All Saints Chapel at Good Samaritan Society in Hastings, Nebraska. Burial at Prairie Home Cemetery in Holdrege, Nebraska. DeWitt Funeral Home and Cremation Service is handling arrangements. Memorials may be directed to his family for a later designation. Wayne was born April 10, 1941, the son of Donald Elmo and Alma (Levine) Cover. He was raised on a farm near Lexington, Nebraska. Wayne attended Longfellow High School and Kearney State College. He became a construction worker and many of the buildings he worked on are still standing today. Wayne joined the US Army for 2 years. He married Glenys Kay Figgins on December 25, 1965, and adopted four daughters, one child, Dawnetta, was born to this union, Kay passed away in 1987. Wayne then married Charlene (Hayes) Johnson. His family moved and lived in Fort Collins, CO, Loveland, CO, and along the Horse Tooth Reservoir. In 1970, they moved back to Nebraska to be closer to family. 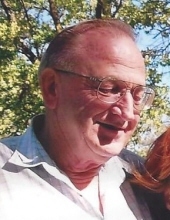 Wayne worked at Eaton Corporation and Dutton Lainson, from where he retired after 25 years as a maintenance supervisor and cherished the many friends he made there. He loved fishing, hunting, tinkering in his shed, and cherished his time his grandchildren and great-grandchildren. He was proud of his accomplishments including bicycling down Pikes Peak, and helping his family using his carpentry skills. Wayne is survived by his brother, Roger Cover; four daughters, Cynthia (Mark) Simm, Katherine (Max) Stoner, Linda Burnett (Bill Young), and Dawnetta (Jack) Buckingham; multiple grandchildren and great-grandchildren; and two step-daughters, Michelle Bird and Vickie (Mike) Mcleod. He was preceded in death by his first wife, Kay; second wife, Char; daughter, Brenda Kay Shaw; and brother, Rex Cover. To send flowers or a remembrance gift to the family of Rodney Wayne Cover, please visit our Tribute Store. "Email Address" would like to share the life celebration of Rodney Wayne Cover. Click on the "link" to go to share a favorite memory or leave a condolence message for the family.